There is something immensely satisfying about the classic Sussex trug. It is still hand-made from coppiced willow and chestnut in Sussex - a county with which we feel a strong affinity. The trug is a staple feature of many great English gardens. An object of simple beauty, a genuine Sussex trug will only mellow and improve with age. The quality of old linen is hard to beat. We always have a selection of vintage tea towels in stock. Most are sourced from France, though we have also found beautiful examples from Hungary. Many display the finely embroidered initials of their original owner, to help identify them during laundering. These tea towels will become softer and more absorbent with use. Drab in name but not by nature! 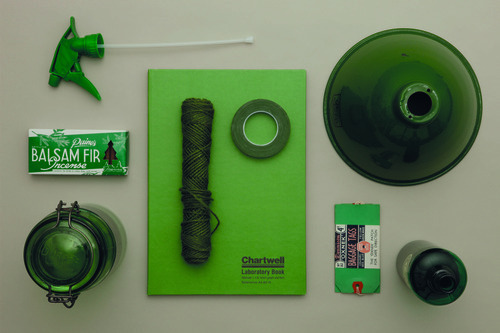 We like the functional aspects of this organic colour, which makes us think of army kit and outdoor clothing. It is a difficult shade to define, ranging from greeny brown, to browny green. We also enjoy its association with the clays and glazes used by studio potters. Made from olive oil, this mild, totally naturally soap has all the credentials of a classic Labour and Wait product. It is pure, economical and astonishingly versatile. You can use it to wash your home, your laundry, yourself - and even your pets! The city of Marseille has an association with making soap which dates back to the 17th century. This now iconic milk pot caused something of a storm when it was given a full page in a Sunday supplement. We were taken off guard when the readers took it to their hearts as we had done. A deluge of enquiries resulted in a waiting list of almost 200 customers! The milk pot is now available in exclusive colours and remains a favourite. This rope doorstop is hand-made by Des Pawson MBE, a leading authority on rope and knot work. It takes the form of a giant Monkey's Fist knot. Hidden inside are two half-spheres of solid lead. Weighing in at over three kilos, this doorstop has often caught the eye of overseas visitors, but usually common sense prevails! A colour associated with straw, wood, dried grasses and wicker. It also evokes brown paper and cardboard. Its neutrality makes it a good background for typography. 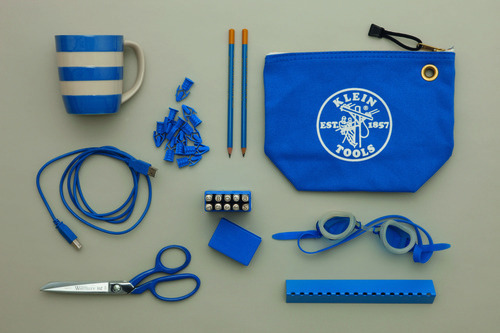 It is entirely at home in the world of craft items, and is a signature colour at LABOUR AND WAIT. Our canvas aprons have become a Labour and Wait classic. We made the prototypes ourselves, as our staff uniform. Soon customers were wanting to buy them, so we found a factory in the UK and started production. 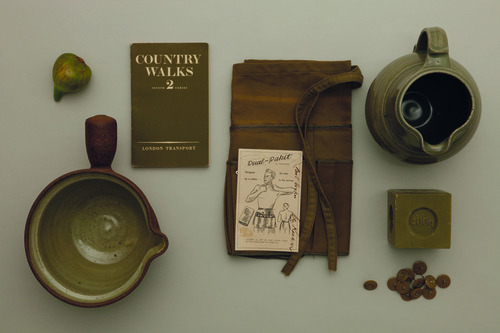 From these humble beginnings, we now supply the classic brown apron to restaurants, coffee shops and bars worldwide. Hundreds more have been sold to individuals via our shop and website. This simple glass tumbler takes us right back to school dinners. These glasses have 'mystery' numbers embossed on the base, providing lunchtime entertainment. Although we associate these tumblers with our childhood, they are the perfect size for a decent glass of wine at the end of a long day. Their pleasing, rounded shape and simple, functional design make them a joy to hold. We bought one of these dustpans in America and, once we used it, became even more convinced of its great design and practicality. It has been produced for many years and is widely used in the building and carpentry trade in the USA. On more than one occasion, customers have come back to buy a replacement after the builders had appropriated the first one! These blankets evoke fond memories of holidays in Wales and of mill shops selling items made from traditional tapestry fabric. These could be anything from complete outfits including bags and hats, to coasters and placemats (well, this was the 1970s!) We have collected and sold hundreds of vintage blankets. Today, we work with one of the few remaining Welsh mills, who continue to weave this fabric. This classic item of workwear has been an essential outer layer for British fisherman for over a century. The practical, utilitarian nature of the smock makes it popular with painters, sculptors and craftsmen. Most staff at Labour and Wait seem to own one! Our smocks come from Norfolk, where they have been produced since 1898. As ardent tea drinkers, we believe that a good teapot is indispensable! This classic teapot is still made in Stoke-on-Trent, as it has been for generations. We specify a clear glaze, to allow the colour of the local brown clay to shine through, as this gives the Brown Betty its name. Successive generations have sworn that these teapots make the best pot of tea in the world. This was the first broom on our wish list when we opened our original shop. Its humble design and good looks appeal to us. This type of broom originated with the Shakers in 19th century America. It is practical and hard-wearing - and of course it features in ﻿Tom and Jerry ﻿cartoons! We have selected fifteen products which embody the Labour and Wait ethos, which we will feature here each week for 15 weeks. 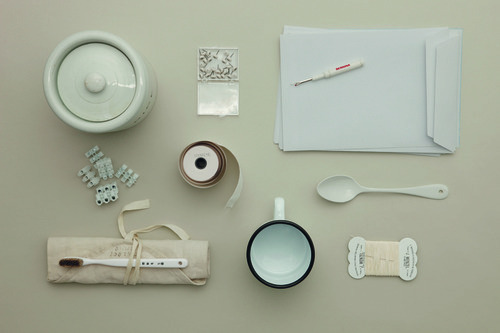 These items have been present in our offer since the very beginning. 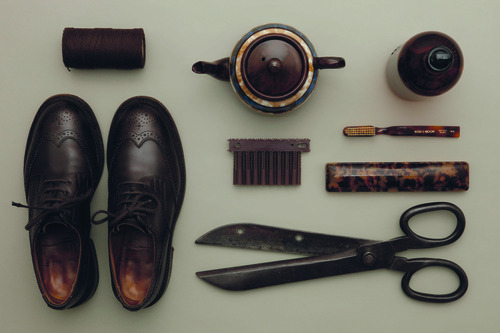 We believe that they are as essential today as they were back then; timeless products that are forever useful. 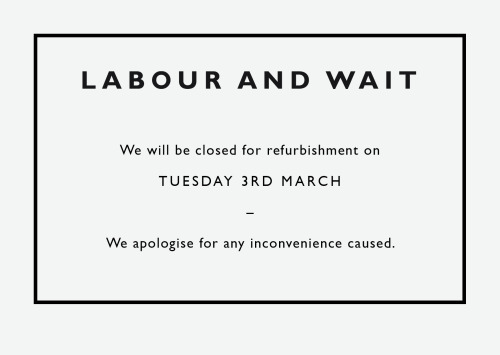 From the outset, there was only one typeface in our minds for Labour and Wait: Gill Sans. These classic letterforms were designed by Eric Gill and first appeared around 1928. For us, Gill Sans perfectly embodies a graphic simplicity; clear, informative and timeless. 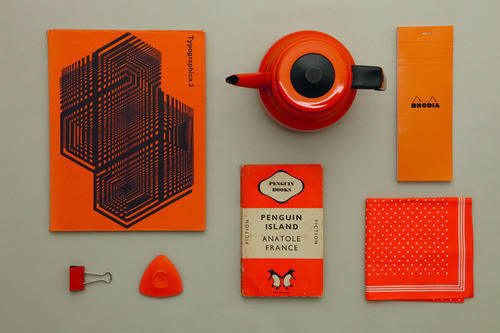 Naturally, our choice was influenced by the iconic covers of the first Penguin books. Gill Sans was also widely used for industrial supply catalogues from the 1930s through to the 1950s, which we enjoy collecting. In addition, we appreciate traditional stationery such as rubber stamps, embossed cards and school exercise books. We like to reference all this material in our branding. A strangely synthetic shade of blue. Applied to many functional everyday products and frequently found in toolboxes. Rawlplugs, electrical wiring, and screwdriver handles often come in this striking shade. Plastics and other man-made materials give the colour a special vibrancy. Our goods come from many different sources. We endeavour to search out specialist makers who in many cases manufacture products to the original deigns, using traditional methods. Our suppliers range from highly skilled individual craftspeople - like rope work Des Pawson or Sussex trig maker Robin Tuppen - to small family-run workshops such as R. Russell, brush makers. We also work with larger factories like Riess Kelomat in Austria, but this again is a family business. 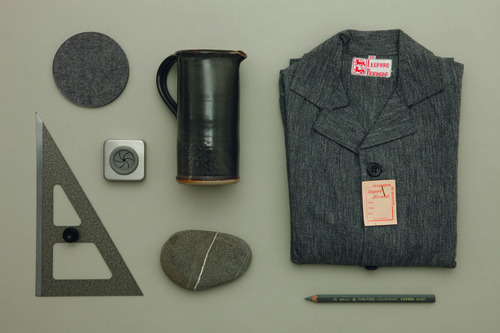 More recently, we have begun collaborating with our makers to develop products which are exclusive to Labour and Wait. It is a real pleasure and privilege to work with these companies and hopefully to ensure the continuity of traditional industries. We stock vintage items too, always carefully selected. Again, these are objects which have a timeless quality, but all must be fit for use, not just for display. We keep a constant lookout for favourites like stoneware marmalade jars or Lovatts coffee pots, which sadly are no longer made. Labour and Wait is 15 years old today. Our aim from the start has been to offer a selection of simple, functional products for daily lie, which not only 'do the job' but look great as well. It had become increasingly difficult to find good-quality 'undesigned' articles, which by their very nature do not date. In fact, we believe such objects actually improve with age as they develop a patina through use. This philosophy, which has always guided our choice of household products, applies no less in other categories. Classic practical clothing, for example, has been part of Labour and Wait since we began - from striped Breton shirts to genuine Guernsey sweaters. We aim to source or create products which have a universal appeal and are not bounded by age or gender. In our fifteenth anniversary year, our original concept and beliefs remain unchanged. 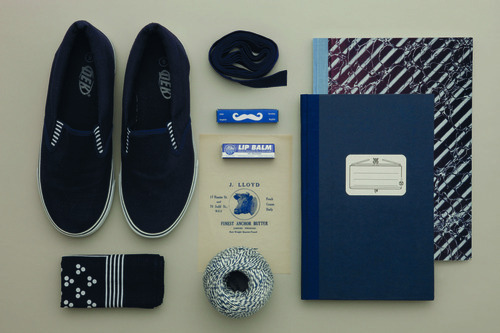 This rich dark blue is a true classic, originating from naval uniforms. It is often contrasted with white or ecru. The classic striped Breton T-Shirt has become a LABOUR AND WAIT favourite. Textiles take this colour particularly well. It is also effective when used for typography, instead of the more obvious black. 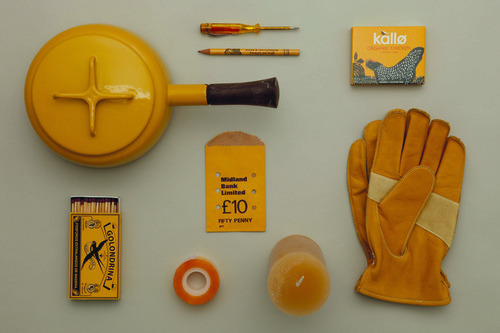 An optimistic colour which heralds the start of spring, promising a wealth of things natural; the yellows of beeswax, mustard seeds and egg yolk. But not for us! Instead, this colour makes us think of rubber gloves, dusters and protective oilskin clothing. This shade of green reflects our appreciation of an industrial aesthetic. Whenever we visit factories, we notice this particular colour all around us. It seems that much industrial machinery of the past as painted in this shade of green. This is not a natural colour but rather a mechanical one. A true red which demands attention. 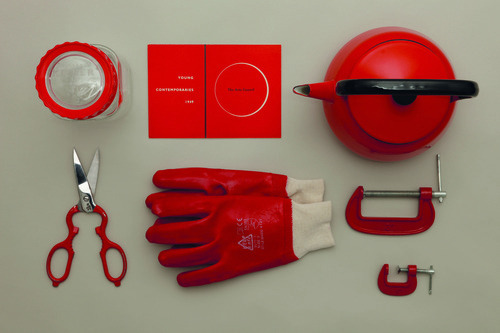 Historically a colour of passion and power, red also has strong associations with danger. For us, it is a very British colour, redolent of London buses, telephone boxes of old and regimental uniforms. 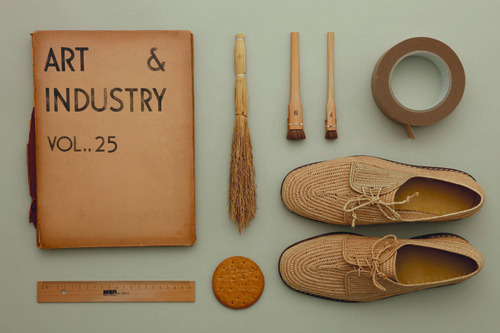 It also lends itself to utilitarian products and tools. Deep and dark, black gives objects a sculptural quality, as it defines their shape. 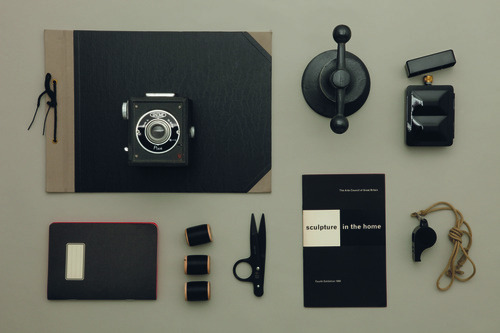 We often choose black products for LABOUR AND WAIT; the density of the colour can create a dramatic effect. The bold, graphic combination of black with white always has impact.